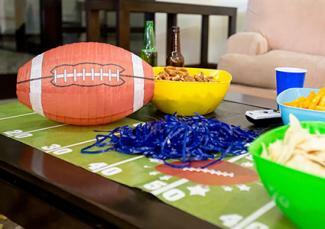 Score a touchdown at your next celebration with these festive football party decorations. These decorations will dress up the party room and leave your guests cheering. There's more than one way to celebrate football. The popular sport unites fans of all ages. Watching the Super Bowl is a popular reason for hosting a football party. The theme also works well for a birthday party or an end-of-season celebration for a kids' football team. There's no need for a special occasion. Any time your favorite college or pro team plays on TV is a good reason to celebrate with a party. Selecting a color scheme for the football party helps create a cohesive look. If you have a favorite football team, use the team's colors for the party décor and tableware. 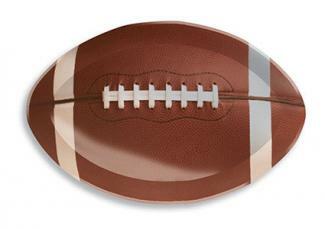 Other common colors used for football parties include red, blue, green and brown. Give the tables a decorative makeover for the football party using these ideas. Start with a decorative tablecloth that fits the theme. A green tablecloth resembles the football field. Add yard lines using thin white tape. For a more realistic look, purchase outdoor carpet that resembles grass as a table covering. Use it to cover the entire tabletop or make runners down the middle. Pompoms attached to the corners of the table set the stage for the food and guests. Carry the football theme to the serving dishes for the football party food. Bowls shaped like footballs are ideal for chips, buns and other snacks. Another option is to use trays with a football theme. For the drinks, fill a big tub with ice and arrange cans of soda or other beverages in it. A large beverage-dispensing cooler filled with Gatorade or other juice brings to mind the traditional Gatorade dump that football players sometimes do to the coach after a win. Water bottles make a fitting option for serving the drinks. Party favors add to the overall party décor in addition to offering a fun parting gift for the guests. Ideas for favors include whistles, foam footballs, football-shaped chocolate, miniature trophies, football stickers and football trading cards. Add the party favors to the main table to add to the decoration. Hang football jerseys, pennants, team blankets and other flat football items around the house. Cut football-related shapes from cardboard and paint on the details. Make a goal post from large cardboard tubes. Glue the tubes together and place the post in a bucket of sand for support. Suspend a football piñata in the party room for both decoration and fun. Set up an inflatable football player lawn ornament inside if the room is large enough. Hang posters of favorite football players around the room. Set up life-sized cardboard cutouts of football players. Hang streamers and balloons in the football party color scheme. 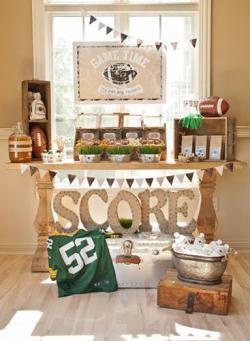 Coordinating the football party decorations with the other party elements creates an overall atmosphere of pigskin fun. Whether you're celebrating the Super Bowl, a birthday or just your favorite team on the big screen, the party theme decorations add the finishing touches to the party plans, tying it all together.